One of the most powerful stories from the Bible is surely the creation myth that explains how God created the world and all the creatures within. It is clear humans have a distinct place in this creation and that the origin there is Adam. There is a long-standing debate since Roman times of whether there was other men living outside of Eden at the time but it logically follows there must have been more men than God’s chosen couple for the biblical text to be coherent – i guess i would be a Pre-Adamite were i religious. There is no doubt that Eden was a Paradise and that Adam was first alone before Eve made her appearence and later induced the ‘fall of man’ by eating the fruit (apple) of the forbidden tree of good and evil – lured by the snake. The perfect conditions of Eden and libertarian innocence thus was put to an end and Adam and his Partner Eve were cast onto the outside world shameful and covered in clothes. As the archetype of human perfection Adam and Eve are also clearly symbolically the origin of the civilisation we today live in. In such a scenario it is clear that the pristine couple Adam and Eve is an important symbol that really matters in how we are to understand our origin and heritage – despite anyones worldview or religious beliefs. The numerous depictions, sculptures and lore around Adam and Eve has historically been very rich and a longstanding effort where the most talented artists have been working hard to best represent man in the best manner with most primordial features – and they are not always very clear-cut. What stands out in artistic representations of Adam & Eve since the 12th century (according to official history) is nothing else than Androgyny. It is very difficult to find any representation at all of Eve where she actually feature uniquely female gender-characteristics. One would think the model female would be unmistakably feminin but that is nowhere to be seen. Mostly both Adam and Eve are both quite hard to evaluate pertaining to their gender-traits despite the fact representations of Adam & Eve were carefully constructed in traditional paintings and sculpture where the result is fully controlled by those who master these arts. No detail in depictions of God’s chosen couple made in his image can be ignored from the masterpieces of art we have to study to come to terms with what now seems obvious to me : there is an esoteric side to how God created man and women – the language used is inversion and A Dame is female while Eve is a metaphor to depict the V shaped man – just the A imitate the pregnant shape of a female. Adam is a ‘dame’ and Eve never was impregnated but gave his seed to Adam with help of the serpent – a phallic metaphor. I’m aware the proposition might be bold, but when we study the imagery and esoteric side to the original “perfect” couple we can see signs of deception and inversion to a point where there is little doubt we indeed face Elite Gender Inversion in plain sight. And how could it be any different? We live in a society founded on judeo-christianity where the our ruling classes and Elite clearly are EGI in majority. It therefore stands to reason that organised religion is planned and written by men for men in their favour and advantage. The men we see behind this are EGI just as Adam was a woman or hermaphrodite and Eve merely the sexual partner carrying seed and company or divertissement. 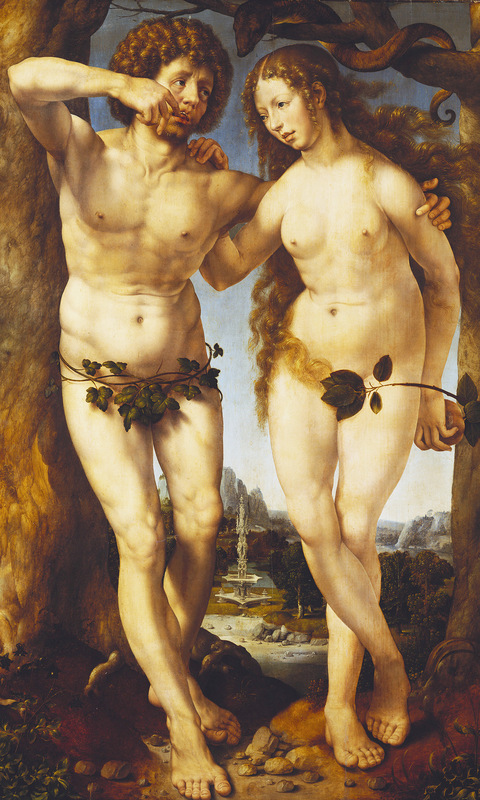 •Notice how Eve holds the (Adam’s) Apple and crosses the legs as if to have something to hide. Eve’s toes are close together and her kneecaps bigger than A dame. Adam has his legs spread out and seemingly nothing to hide. No male genitalia could possible hide in Adam’s pose – but Eve’s pose could. He also displays a disproportionately long index finger on his left hand while putting his right index into his mouth… Adam also has a significant gap between his toes contrary to Eve and smaller knee-caps. If the snake is a phallic symbol in this picture it is clear it comes from Eve’s side and focuses on Adam not Eve. If we look at both individuals bellies it is Adam who has the low typically female bellybutton and also the most significant belly-bump. Despite Eve having larger hips in the painting she does have the flat belly and male positionned navel out of the two.